It’s been a while since I’ve done a favourites post and I have to be honest with you, this month I haven’t been loving all too much.. So I’ve decided that instead of skipping out on yet another favourites post I’d post the 3 things that I have been favouriting in the month of June. First up is Nip+Fab Body Shimmer Leg Fix* a ‘golden hydra-cream moisturiser for luminous legs’ and boy oh boy do I love this product. I haven’t tried too many things from Nip+Fab before now, but the ones that I have have always been an instant hit with me. This leg moisturiser has a gorgeous golden shimmer to it and when out in the sun especially, you can see a real gleam on my pins. I really love how this is super hydrating (and I mean super), my skin drinks this up really well and my legs are always left amazingly soft all day long. I love this for every day use once I’m out of the shower, but especially when I’ve got imperfections on my legs. The golden shimmer really works wonders on masking them and making my legs look just that little bit better. Next out of my oh so many favourites this month is the Dr PawPaw Original balm*. This little lady (yes my balm is a ‘she’) has un-chapped my lips and softened my cuticles like a dream over this past week. I didn’t think I would ever find a product that would get my lips feeling baby soft again, but this one has done it. This Dr PawPaw Original balm is a multi-tasking (see why it’s a ‘she’ now?) balm which can be used as a lip balm, a cuticle balm and just as a general skin and hair balm. I’ve been using this as I’ve mentioned on my lips and my cuticles, but I gaurntee that this baby can probably work way more miracles. I really like how the tube applicator is just like that of a lipgloss tube, slightly tapered at one end for easy application, it definitely helps with applying to cuticles too. It’s a great waxy-balm of which a little really does go a very long way. I’m definitely going to be getting my hands on one of the full size tubes next! 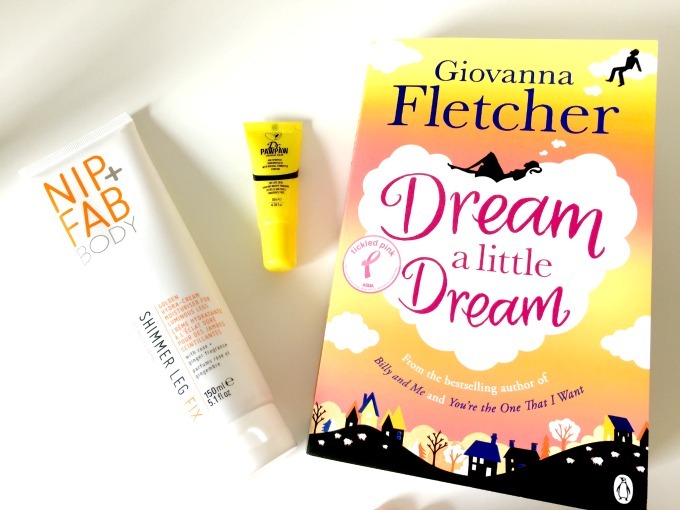 The last favourite of June is this book ‘Dream a Little Dream’ by Giovanna Fletcher. Now you all know that I am a huge McFly fan, so when I picked up Giovanna’s first boo (Billy and Me) I was all about the fact that she was married to Tom, however fast forward a few years and Gi has definitely become one of my favourite authors and even though this book has not even been out a week yet, I’m already craving lots more from the lady! Come On Gi, release more! Dream a Little Dream (without giving too much away) is a lovely book written from the perspective of protagonist Sarah who is still battling through the woes of a breakup with her ex, who happens to still be part of her close knit friendship group – along with his new girlfriend, the one he dumped her for! Over the course of the book many things happen that turn Sarah’s life around and I really do mean it when I say that I could not put this book down. I’m a massive book worm, but recently nothing’s been quite grabbing me like this has! I actually stayed up reading to way gone my bed time last night to finish this as I just could not put it down. If you’re a fan of girly books or a fan of any of Giovanna’s other books, you’ll absolutely love this one! Definitely a must read ladies! So that’s it – a short but sweet roundup of my three ‘out there’ favourites this month! Hopefully I’ll have more to add to the basket next time, but I really hope this gets you all interested in some of the things I’ve mentioned either way! What were your favourites this month? Leave a link in the comments to any of your posts / videos! I think I'm definitely going to buy Giovanna's books for my holiday reading, they get such good reviews!